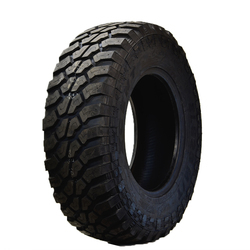 Xcent Mud All Terrain Light Truck Tire. 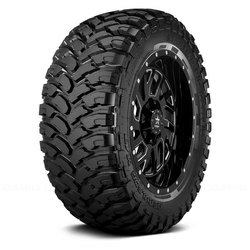 QR900-M T has a very aggressive tread design for maximum traction and performance in all off-road conditions. Large tread voids to provide self-cleaning tread pattern for superior traction in mud, dirt and rock surfaces. Strong steel belt construction for maximum strength, stability and durability. QR900-M T is M & S Rated. The Roadian MTX features an aggressive design that is extremely versatile for on- and off-road driving. Each tire boasts a dual sidewall design that allows you to customize the look of the tire on your vehicle. The Roadian MTX also features a standard 3-Ply design and F-Load weight rating that makes it extremely capable for heavy hauling. With such rugged traits you wouldn’t expect the Roadian MTX to be as quiet as it is on the highway, but thanks to its patented tread block design the road noise has been minimized. 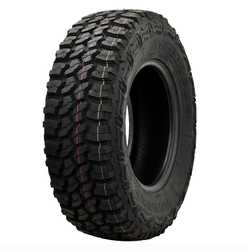 Serious Off-Road Tread terrain conforming blocks and high void tread design with open shoulders for extreme traction in mud, snow, and rock crawling. Mountaing grip design provides multi-directional traction at low tire pressure on various terrain with enhanced protection from rocks and stone penetration. Enhanced mud and rock defense for longer and taller fins on the tread grooves shed mud easily while protecting the base of the tread from rock punctures and penetrations. The AMERICUS Rugged M T is a Premium high-void Mud pattern with large shoulder blocks for deep traction and crisp handling in on-road and off-road conditions. The self-cleaning tread has thunder-bolt stone ejectors. The joint-less spiral nylon over-wraps provide extra toughness and 3-Ply body plies (in larger sizes) helps protect against sidewall impact. Repulsor RBP Mud All Terrain tire. 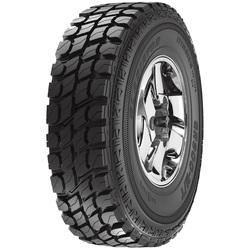 Excellent tread, sidewall, and shoulder treatment for exceptional performance off the road. Provides superior performance under any weather condition. For a truck tire, it produces less noise allowing you a smooth and comfortable ride. The Kenda Klever R T was designed to conquer rough terrain without sacrificing the ride and comfort of an A T tire. 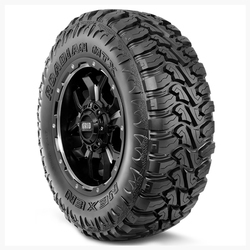 Combining our triple threat 3-ply sidewall for exceptional durability with aggressive styling , an optimized tread design with a superior all-weather compound makes the Klever R T the right solution for 4x4 owners on the road, in the snow or in any off-road environment. 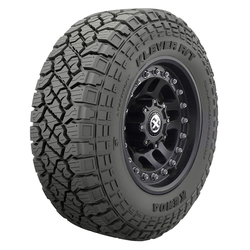 The Klever R T is enabled for off-road conditions and is pinned for winter studs. 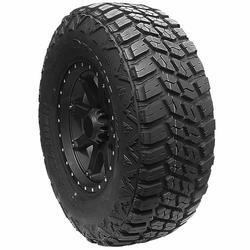 Strong upper sidewall tread blocks assist with typically difficult mud, sand and gravel environments while the construction provides long lasting wear with reasonable ride and noise on-road.